Olga Patramanska-Bell was born and raised in Ukraine, where she received her musical education. After finishing her Bachelor's degree at the R.M. 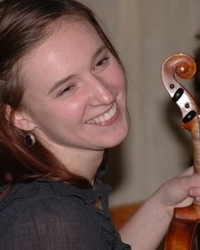 Glier Kyiv State Higher Music College and studying a few years at the National Musical Academy of Ukraine, she came to Boston to continue her education at the Longy School of Music in Cambridge, MA. She received her Masters of Music degree under the guidance of Mr. Mark Lakirovich. Olga is an active performer and participant in numerous concerts, projects and festivals. She is a winner of Concerto competition and Honors competition at the Longy School of Music, and has performed as a soloist with the Longy Chamber Orchestra, National Pops Symphony Orchestra, and Philharmonia Orchestra in Ukraine. Olga is a winner of several competitions in Ukraine and has travelled through Europe performing solo recitals and playing in violin ensemble. In addition to teaching violin at Winchester Community Music School, Olga is currently a member of Zefira trio, Grand Harmonie, and Atlantic Symphony Orchestra, and is an assistant member of the Boston Philharmonic Orchestra and Symphony New Hampshire. Olga has performed with such groups as Boston New Music Initiative, Equilibrium Ensemble, Walden Chamber Music Players, ECCE ensemble, and Harvard Baroque Chamber Orchestra. She has served as a concertmaster for Boston Opera Collaborative, Harvard's Lowell House Opera, and Commonwealth Lyric Theater. This year's engagements include performances with Juventas New Music Ensemble and Sound Icon.